St Joseph of Cupertino is invoked by many students to help with their exams. He was a holy man and a great Saint, despite being academically challenged. St. Joseph of Cupertino was born near Naples, Italy in 1603 into a very poor family. He was not a very bright child and struggled with the simplest school work. This made him an object of fun for his school friends and neighbours. He knew that he was not clever and that he was clumsy, bad-tempered and had trouble relating to other people. As he was also sickly his childhood was not a happy one but Joseph had a very strong faith, he was very humble and accepted all his suffering as the will of God. When he was about seventeen he saw a Friar begging for food. He realised that this was something that he wanted to do with his life and he joined the Franciscan Friars. But he struggled with studying and was treated very badly. He was eventually asked to leave because he could not concentrate on his studies and it was thought that he would be unable to pass the exams. Joseph tried to join other monasteries and friaries but they turned him away either immediately or after a few weeks when they realised that he was not clever enough. Joseph sadly returned home. He looked like a failure to his family and friends but he believed and trusted that God had great things in store for him. He decided that if he could not be a friar then he could still help them and started working as a stable hand for the Franciscan Friars. He gave himself up entirely to a life of humiliation, mortification, and obedience and showed such love, purity and humility in his work that the Friars noticed his holiness and he was invited once more to join them. By God’s miraculous intervention, Joseph completed his studies and was ordained as a priest in 1628. He always had a great devotion to the Blessed Virgin Mary and promoted her devotion among the people so he was sent to work at the Shrine of the Madonna Della Grazia, where he stayed for fifteen years. His life as a priest was a long succession of visions and other heavenly favours. After his ordination it is claimed that he began to levitate while saying the Mass or while reciting the Prayers of the Church. He would be so deep in prayer that his body could ascend towards heaven and he would be seen floating in the air in a kneeling position. He could be moved to an ecstatic state by a holy picture or the mention of the name of God, the Blessed Virgin Mary or one of the Saints. Those who witnessed these mystic experiences saw them as a sign of Joseph’s great holiness, purity and humility but his religious superiors thought that he was being disruptive and eventually stopped him from appearing in public and for thirty five years Joseph was made to stay in his room in the monastery, where he had a private chapel. He spent many lonely years being moved from one monastery to another, but Joseph retained his resigned and joyous spirit, submitting confidently to Divine Providence. He lived a very simple life, eating little and spent his days in prayer and contemplation. He died on September 18th 1663. St. Joseph of Cupertino was beatified by Benedict XIV in 1753 and is the Patron of students preparing for exams, pilots and aviators. There is great devotion to Saint Joseph of Cupertino among school, college and university students, who request his intercession and intervention when preparing for exams. There are traditional prayers that can be recited and many young people testify to their effectiveness. Why don’t you ask St Joseph of Cupertino to help you with your exams? 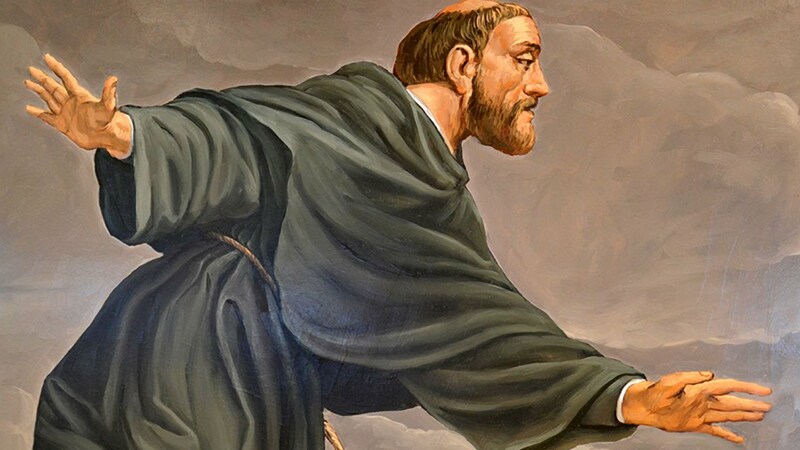 Prayer to St. Joseph of Cupertino St. Joseph of Cupertino, in your life time you received from God the grace to be asked in your exams only the questions that you knew, I pray that you will obtain for me a similar favour in the exams for which I am now preparing. St. Joseph of Cupertino, Pray for me. Amen.